This concept design looks really interesting. 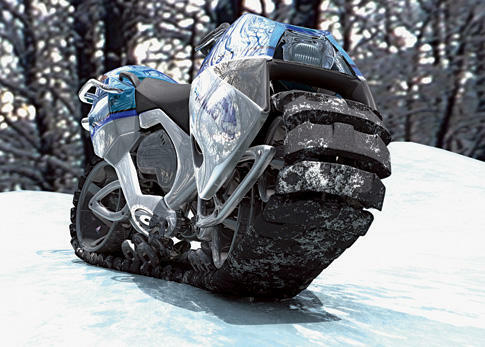 It was created back in 2006 by Oliver Keller and Tillman Schlootz from Germany for the 2006 Michelin Challenge Design. If ever manufactured it could become a top choice among recreational vehicle purchasers. 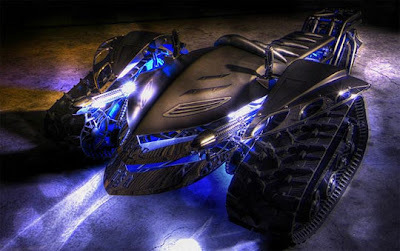 Which would you choose a dirt bike, four wheeler, snowmobile, or the Hyanide which incorporates all three? The recent Discovery channel show "Biker build off" featured a bike by Paul Teutul of OCC with some striking similarities to the Hyanide. Both use tracks instead of wheels, controls are very similar, same color scheme. Teutul could have very well received inspiration from the Hyanide either way they are both pretty cool concepts.